We get the question “When is Tax Free Weekend 2019?” a lot, so here is our best answer. To help drive the economy during the slower shopping months of the year (July & August), the state governments of various US states decided to temporarily not collect taxes on various items. Due to this normally being for one weekend only, it was referred to as a “Tax Free Weekend” or a “Sales Tax Holiday.” Full details of this are available on our chart below. Louisiana Tax Free Weekend isn’t happening until 2025! Full story here. 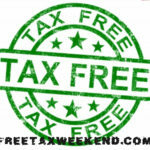 ** Updated for 2019 Tax Free Weekends and Tax Free Weeks. Alabama Back To School – Click here for date: clothing (not accessories or protective or recreational equipment) with sales price of $100 or less per item; single purchases, with a sales price of $750 or less, of computers, computer software, school computer equipment; noncommercial purchases of school supplies, school art supplies, and school instructional materials with sales price of $50 or less per item; noncommercial book purchases with sales price of $30 of less per book. Alabama Severe Weather Preparedness: Date Above: severe weather preparedness items that cost $60 or less, except for portable generators and power cords used to provide light or communications or preserve food in the event of a power outage, which are covered as long as they cost $1,000 or less. Alabama Severe Weather Sales Tax Holiday 2019. Arkansas Sales Tax Free Weekend – Date Above: clothing items under $100, clothing accessory or equipment under $50, school art supply, school instructional material, and school supply. Georgia Back to School Tax Free Weekend – Date and more information here. : (1) computers, computer components, and prewritten computer software purchased for noncommercial home or personal use having a sales price of $1,000 or less per item; (2) clothing having a sales price of $100 or less per item; and (3) school supplies, school art supplies, school computer supplies, and school instructional materials purchased for noncommercial use having a sales price of $20 or less per item. Georgia Energy Star Tax Weekend Reload the page to see the date at the top: any Energy Star Qualified Product or WaterSense Product having a sales price of $1,500 or less per product that is purchased for noncommercial home or personal use. Iowa Back to School Tax Free – Click here for date: clothing and footwear (not accessories, rentals, athletic or protective) with sales price of less than $100 per item. Louisiana Tax Free Weekend – Date here: first $1,500 of sales price of hurricane preparedness items. Excludes items purchased at airports, hotels, convenience stores, or entertainment complexes.Also first $2,500 of sales price of noncommercial purchases (not leases) of items of tangible personal property (not vehicles or meals). Does not apply to local taxes. However, St. Charles Parish will waive its local Louisiana sales tax during the same weekend as the state holiday. Details here: noncommercial purchases of firearms, ammunition, and hunting supplies. Does not include purchases of animals for the use of hunting. Maryland Tax Free Week – Energy Star products and solar water heaters. Full details and date here: Items of clothing (not accessories) and footwear with a taxable price of $100 or less. Missouri – Find the date here: noncommercial purchases of clothing (not accessories) with taxable value of $100 or less per item; school supplies up to $50 per purchase; computer software with taxable value of $350 or less; and personal computers and computer peripherals up to $3,500. Localities may opt out. If less than 2% of retailer’s merchandise qualifies, retailer must offer a tax refund in lieu of tax holiday. April 19-25: Retail sales of Energy Star certified new appliances of up to $1,500 per appliance. New Mexico Tax Free Weekend – NM Sales Tax Holiday Date: footwear and clothing (not accessories or athletic or protective clothing) with sales price of less than $100 per item; school supplies with sales price of less than $30 per item; computers with sales price of $1,000 or less per item; computer peripherals with sales price of $500 or less per item; book bags, backpacks, maps and globes with sales price less than $100 per item; and handheld calculators with sales price of less than $200 per item. Retailers are not required to participate. Ohio Back to School Sales Tax Holiday – Click here for date –. The following items will be exempt: school supplies with a price of $20 or less, clothing with a price of $75 or less, and school instructional materials with a price of $20 or less. Oklahoma Back to School Tax Free Weekend – OK Tax Free Days: items of clothing and footwear (not accessories, rentals, or special clothing or footwear primarily designed for athletic or protective use) with sales price of less than $100. South Carolina Sales Tax Holiday – SC Tax Holiday Dates details: clothing (not rentals), clothing accessories, footwear, school supplies, computers, printers, printer supplies, computer software, bath wash clothes, bed linens, pillows, bath towels, shower curtains, bath rugs. Tennessee Sales Tax Holiday – TN just voted to change the dates of their sales tax holiday, click here for details. : clothing (not accessories), school supplies, and school art supplies with sales price of $100 or less per item; computers with sales price of $1,500 or less per item. Texas Energy Star Holiday – Date Available Here. the following Energy Star products: air conditioners (sales price up to $6,000), clothes washers, ceiling fans, dehumidifiers, dishwashers, incandescent or fluorescent lightbulbs, programmable thermostats, and refrigerators (sales price up to $2,000). Texas Back To School Holiday Get the date here. clothing and footwear (not accessories, athletic, protective, or rentals), school supplies, and school backpacks with sales price of less than More information Virginia Sales Tax Holiday – Date Available Here. clothing and footwear with selling price of $100 or less per item, and school supplies with selling price of $20 or less per item; portable generators with selling price of $1,000 or less and other hurricane preparedness items with selling price of $60 or less (expires on July 1, 2019); noncommercial purchases of Energy Star and WaterSense qualified products with a sales price of $2,500 or less per item (expires on July 1, 2019). States not participating in Sales Tax Holidays are Arizona, California, Colorado, District of Columbia, Georgia, Hawaii, Idaho, Illinois, Indiana, Kansas, Kentucky, Maine, Massachusetts, Michigan, Minnesota, Nebraska, Nevada, New Jersey, New York. North Carolina, North Dakota, Pennsylvania, Rhode Island, South Dakota, Utah, Vermont, Washington, West Virginia, and Wyoming. Check out our post on states with no sales tax. How should I handle my online sales during sales tax holidays? Online sellers should not collect sales tax on tax exempt items during each state’s sales tax holidays. Walmart will turn off sales tax collection for you for items coded as school supplies during sales tax holidays for the Walmart Tax Free Weekend. Amazon Sales Tax Holiday doesn’t normally collect sales tax on most items unless you live in certain states. Nothing in California? Bloodsucking Liberal Democrats squeeze every penny they can out of the American people. They never let anyone have an edge.